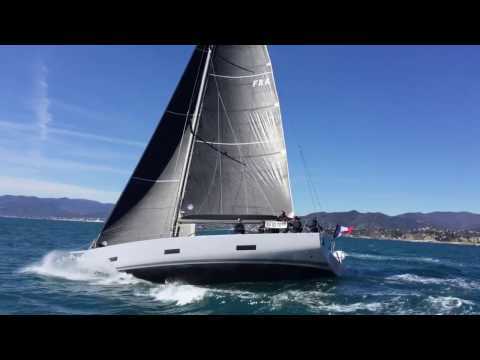 Ice Yachts is introducing the sporty version of ICE 52, the ICE 52RS. Compared to the standard ICE 52 model, the ICE 52RS version has a total weight reduction of about 1600 Kgs, also thanks to the installation of lithium batteries. The ICE 52 RS, designed and concerted by Umberto Felci together with the boatyard’s team lead by Enrico Malingri, is an all-carbon cruiser/racer aimed at competitive owners, who want top performance in regattas while still enjoying comfort while cruising. The modern lines feature a reverse bow with a carbon bowsprit of optional length between 1.3 and 1.8 meters and a Volvo Open 70 inspired stern. The underwater profile, with a bulb keel with a draught of 3 meters is designed to deliver the optimum performance at every wind angle. When not in racing mode, the slick hull will give you 9.2 knots on the engine alone and in the garage you can fit a 2.85 meters tender without deflating! !